PHOENIX, Arizona — Editor’s note: Contrary to what many of us hoped, people in the Baby Boom Generation continue to progress into old age. As that happens, the number of people in the United States with vision loss, including blindness, could balloon by more than 60% by the middle of the century. With that in mind, many eye care professionals are stressing the need to incorporate disease prevention in primary vision care, with an emphasis on healthy lifestyle, healthy diet, and the addition of dietary and nutritional supplements. During a special session devoted to prevention here at the annual meeting of the American Academy of Optometry, Jeffrey Anshel, OD, FAAO, discussed the crucial role that essential fatty acids play in ocular health. Dr. Anshel is president of the Ocular Nutrition Society, and is in private practice in Encinitas, California. He discussed the effect of good nutrition on vision in an email interview with Medscape Medical Newsafter the presentation. Medscape: In addition to fish, what foods contain high levels of essential fatty acids? 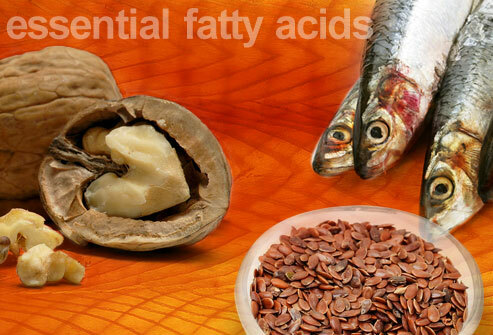 Dr. Anshel: Essential fatty acids is a broad class of nutrients that include short-, medium-, and long-chain fatty acids. There are several categories of fatty acids, but the ones we are typically interested in are the omega-3 and omega-6 categories. These come from foods such as vegetable oils (corn, safflower, canola, etc.) for the omega-6 fatty acids and flaxseed oil and black current seed oil for the omega-3 fatty acids. Medscape: What is fueling the recent interest in omega-3 fatty acids? Dr. Anshel: Omega-3 has been all over the map on its health effects, especially in heart health. More than 20,000 studies have been conducted on the effects of omega-3 on human health. The vast majority have shown positive effects. Medscape: How early in life do the positive effects of omega-3 consumption show up? Dr. Anshel: Actually, prenatal vitamins are now routinely enhanced with DHA (docosahexaenoic acid). That’s primarily because studies have shown positive effects on visual system development. So it’s never too early to start thinking about the intake of essential fatty acids. Medscape: Most American children don’t get nearly enough fish in their diet. What is the subsequent impact of this on ocular health? Dr. Anshel: Between the ages of 1 and 9 years of age, kids get almost no fish in their diets. We don’t know exactly what negative effects might result from that, but we do know that DHA (from omega-3) is critical for brain growth and development. Medscape: What effect does omega-3 have on dry eye syndrome? Dr. Anshel: Most eye care professionals are aware of the positive effects of omega-3 on dry eyes. However, omega-3 only works on one aspect of the anterior ocular surface (usually the meibomian glands). Eye care professionals are often unaware of the positive effects of the omega-6 essential fatty acids on the production of prostaglandin E 1, which supports the mucous tissue, including the tear film. So a combination of the right ratio of omega-6 to omega-3 is the best application for dry eyes. If used properly, good results are obtained much quicker. Medscape: What role does omega-3 play in preventing and/or slowing the progression of age-related macular degeneration (AMD)? Dr. Anshel: We don’t yet know if any nutrients can prevent AMD, but we do know that some can slow the progression. Much of those data come from the Age-Related Eye Disease Study (AREDS), sponsored by the National Eye Institute. However, the AREDS formula is now more than 25 years old, and the results of a follow-up study, AREDS 2 (which includes fish oils and lutein and zeaxanthin), won’t be known for about a year. Even so, we do know that the photoreceptors are loaded with DHA and that it’s important to their function and survival. Medscape: What effect does dietary fat have on cataracts and diabetes? Dr. Anshel: There are not very many studies in these areas, but a prospective study that followed more than 71,000 nurses for up to 16 years showed that those whose intake of omega-3 was higher also had a lower incidence of cataracts ( Am J Epidemiol. 2005;161:948-959). Additionally, a 1993 study of diabetics showed that adding gamma-linolenic acid (GLA) from evening primrose oil to the diet can stop and even reverse diabetic neuropathy by speeding up nerve conduction velocity ( Am J Clin Nutr. 1993;57[5 Suppl]:732S-736S). Medscape: What dietary recommendations do you make to your patients? Dr. Anshel: We tend to forget that the eyes are actually attached to the body! Thus, what we know about good nutrition (fruits and vegetables, fewer simple carbohydrates, more complex carbohydrates, good quality protein) and a positive lifestyle (no smoking, regular exercise, etc.) can be beneficial for our eyes as well as our overall health. I always make sure that patients realize that “just throwing some pills at a bad diet” is not very effective. We need to pay attention to our lifestyle as well, taking the time to appreciate our successes, and do things that we know will have a positive effect on our health. Dr. Anshel reports being on the advisory board of Natural Ophthalmics and TearLab, and being a consultant for Biosyntrx, Vistakon, OmniiActive, and Bausch & Lomb.